How Casting Simulation Software Helps Foundries and casters. Saves material, and energy used in trial and error. 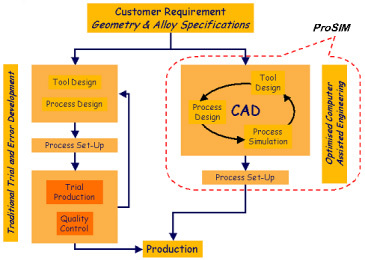 How ProSIM helps foundries to adopt casting simulation? ProSIM is partner of M/S Hitachi Japan, to promote and distribute their unique proprietary casting simulation software ADSTEFAN. ADSTEFAN has many unique features researched and developed at Hitachi Research Laboratories in collaboration with many universities in Japan. Adstefan is developed by Prof Niyama (famous due to Niyama parameter!!) of Tohoku University. By computer simulation of casting process using ADSTEFAN, ProSIM has delivered the following benefits to foundries / casting companies. gating /methoding verification has been conducted. Casting defects such as shrinkage porosity, air entrapment, hot tear, cold shut, distortion, die/ mold erosion, sand inclusion, etc have been predicted.